← When a Hedge Grows Wild. Lurcher’s Crag – An Illustration of Revelation. Have you ever wondered how some Christians wax lyrically about some verse of Scripture that means little or nothing to you? You think how on earth do they find so much in it? It is a question of revelation. 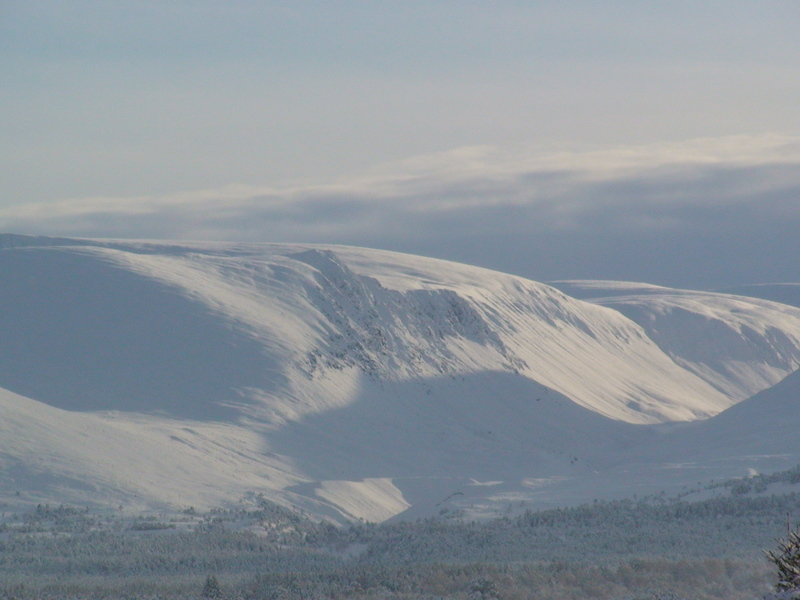 As a secular analogy, many years ago I attended a talk about the origins of the Gaelic names of the hills and mountains seen from Aviemore including that of Lurcher’s Crag. it was stated that it was named so because it looked like a lurcher. As someone relatively new to the area I had not previously noted this, and I could see from the outline of the sketch of the Cairngorms used to illustrate the talk that I could vaguely see the likeness. Yet when I looked at the hills afterwards I could not see it for myself. Years went by until I attended another talk when someone showed a slide of Lurcher’s Crag and pointed out the salient features of the dog-like shape. Now, the next time I looked up at the hills I could really see the lurcher of Lurcher’s Crag. But it is still more obvious at certain times than at others. After all it is a natural feature and not Mount Rushmore. It depends in part in the position of the Sun. it also depends on where you are looking at it from. 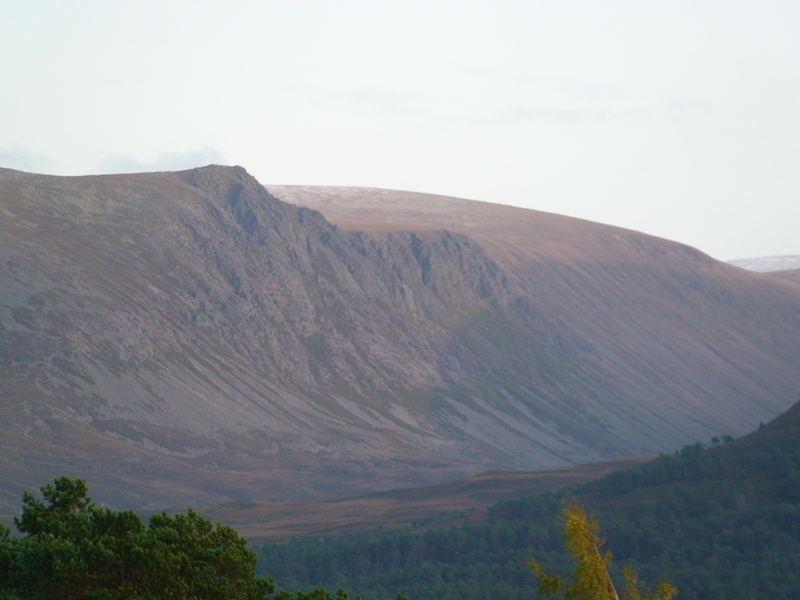 The first photograph was taken too late in the day as the crags are no longer in shadow. But it is often most obvious after a heavy snowfall. Spiritually speaking, we cannot expect God to reveal things to us if we are in the wrong place. We have to be in His Word and subject to His timing. Revelation, when it comes, is rarely as spectacular as in 2 Kings 6:17 when Elisha prayed that his servant’s eyes so that he could see the size of the angelic armies that protected them. It is likely to be a small gem here or a wee nugget there. If you could not see the lurcher in the first picture then look at the second picture with the darker patch silhouetted against the white snow, what appears to be the head, shoulders and rear leg can easily be made out. (Its forelegs can rarely be distinguished.) Now look back at the first and you should begin to see the pattern. Likewise when God reveals something to us we look back and begin to see the pattern in Scripture or in our lives. If I had continued to look for the lurcher after I had first been informed of it, then I might have seen it a lot sooner. Sometimes we need to seek revelation on a certain matter before God will reveal it to us. He wants a hunger in or hearts. He wants us to have more than a passing academic interest in a matter. He wants to know that we are serious. He does not want a Laodicean tepidness. This entry was posted in reflections and tagged Christianity, revelation. Bookmark the permalink.